Welcome to the Flying Circus! Click here to play! We have attractions that will amaze you, confuse you, amuse you and terrify you! From our side shows to the events in our main tent, prepare to be astounded by the Microgaming Flying Circus. First up is Eduardo the Elephant performing tricks for crowd. You will be shocked by his ability to crack peanut shells, stand on his hind legs, breakdance, and beatbox! You have not lived, my friends, until you have heard an elephant beatboxing. A truly incredible animal is this, an act not to be missed. Next in our animal acts is Kristov the Lion, who will thrill the audience with tales of being a single dad. That's right this lion can talk, ladies and gentleman, and he's had a hard life. His deadbeat pride walked out on him, leaving him with 12 lion cubs to feed. He ended up just eating them. It sounds bad, I know, but wait until you hear him tell it. It sounds a lot more reasonable when you're wondering how a lion can talk. The less said about our frightening clown, the better, so let's move right on to our major attraction - Daring Delilah, our resident trapeze artist! Folks, you would not believe the extraordinary strength, timing and resilience of this woman. She has never used a safety net, so she has had quite a few injuries, you can imagine. Still, for her the show must always go on. I once saw Delilah continue her act with three dislocated shoulders and a spine fractured in 38 places. Yes, she really is amazing, so go see her act. What are you waiting for? Roll up to the Flying Circus slots today and look for me, the Ring Master. Find me 5 times on the same payline and I'll make it worth your while. The Clown symbol is the scatter symbol, and awards both prizes paid on the total bet as well as free spins when enough scatter symbols land on the reels. 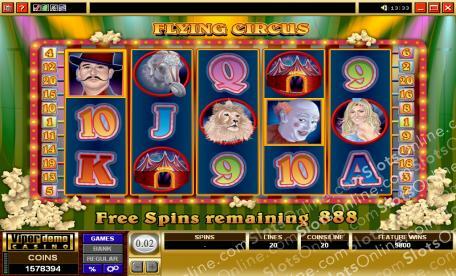 3 or more scatter symbols trigger 25 free spins during which all prizes are doubled and free spins can be retriggered. The Ring Master symbol is wild and can substitute for all symbols other than scatter symbols.